Middlesex University enjoyed a night of success at the recent Universities Association for Lifelong Learning (UALL) Annual Conference, winning the coveted UALL Trophy. 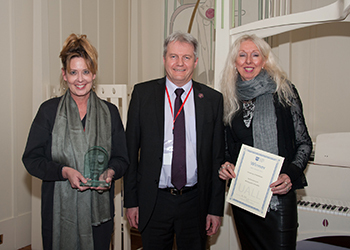 The trophy, which recognises programmes and practices that promote lifelong learning in the higher education sector, was presented to Dr Christine Eastman and Dr Kate Maguire from the Institute for Work Based Learning for their work on writing and criticality. Submissions were marked on their innovation and creativity, sustainability, impact and transferability, and the Middlesex pair beat competition from Wolverhampton, Oxford, Glasgow Caledonian and Greenwich. "This award is recognition of how important clear communication in the form of direct, precise and confident writing is in the professional doctorate at the Institute for Work Based Learning, and in the broader sense of higher education," commented Dr Eastman, a senior lecturer in work-based learning. "The award has spurred us on to reach more who struggle with the empty page, the hesitant voice and the unrealised ambition of what they are passionate to transmit to the world."